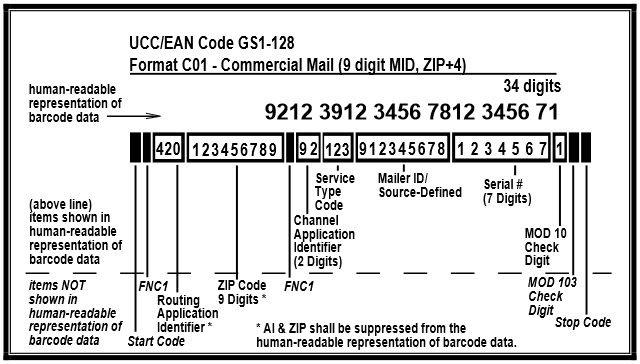 The Intelligent Mail Package Barcode (IMpb) concatenates the destination routing information, such as a zip code, and a package identification code (PIC) together in a single barcode using GS1-128, which is a specialized Code 128 (ISO/IEC 15417) barcodes. Also included in the barcode is an Application Identifier (AI) to designate a specific payment channel, a six or nine-digit mailer ID and a three-digit service type code (STC) to identify a mail class and service, such as Priority Mail with Delivery Confirmation. * There are 2 FNC1 group separators required; the service type codes are now 3 digits and the serial number is now 7 digits (or an optional 11 digits), per the 2015 version of the Publication 199: Intelligent Mail Package Barcode. The start, stop and mod 103 check digits are automatically added in all of IDAutomation barcode products. To create the required Code128 barcode, use Code 128 Auto with ApplyTilde enabled and add in the appropriate ASCII 202 and AI’s (as documented in the GS1-128 FAQ website). A MOD 10 Check Digit is also required at the end of the data encoded. This may be easily generated in IDAutomation products with the ~m command as demonstrated in Fig 3. When printed at 16 points, the IDAutomationC128L font will produce the exact dimensions for GS1-128 (UCC/EAN Code128) required by the USPS special services, which is a height of .75″ and an X dimension of .013″. For more information, refer to the USPS specifications. More information about formatting GS1-128 barcodes with IDAutomation products is provided on the GS1-128 FAQ website. The human-readable characters below the barcode may be easily generated with IDAutomation products by utilizing the SpliceText option with the Sans Serif Bold or equivalent type font. In the event the human-readable characters below the barcode need to be created from code, the Sans Serif Bold font should be used and spaces should be inserted between every 4 digits. Several other combinations are possible. For more information, refer to the USPS barcode specifications. The USPS has also standardized a newer 4-state barcode type defined as the Intelligent Mail Barcode, which encodes delivery and tracking information in a single symbol. If assistance is needed, please contact IDAutomation. If a scanner is needed, IDAutomation also provides barcode scanner kits.